The phone is also great when it comes to multitasking. On the left end of centre button is store all your opened apps. So you can swap from various apps without having to return to your main screen. Not a great fan of this feature – the Nano-Sim! Yes the phone offers a nano-Sim slot of the right slot of the phone. It’s not bad but if you’re switching device regularly it can come as a hassle. The Samsung Galaxy A5 is running on Android 4.4.4 KitKat however, the upgradable version 5.0.2 Lollipop is available. The device is power packed with Quad-core 1.2 GHz cortex-A53. Sleek is an understatement when it comes to the Samsung Galaxy A5. When Vodafone Fiji handed over the smartphone for a review my first reaction when I held the phone was where the phone at? It was light. It barely felt like I was holding a phone. Apart from the phone being light and sleek there many other features to love about the Samsung Galaxy A5. 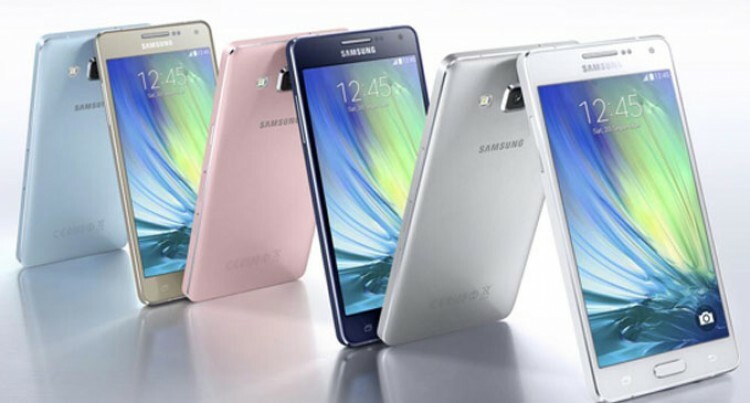 The Samsung Galaxy A5 is the newest range of smartphone for Samsung’s Alpha Range. Considering there were so many mixed reactions of the Galaxy S5 looks like Samsung has taken that all into account and done some great improvements. Let’s briefly talk about one of the biggest concerns with Samsung phones – the use of plastic. Recently it has moved into using metal-framed. It can be seen in the Galaxy Alpha and Galaxy Note 4. But the Samsung Galaxy A5 is full-metal device. It’s like this phone was meant selfies! I personally haven’t loved the camera quality for Samsungs compared to Korea’s LG phones. But this phone allows you to take selfies without literally doing anything! Yes you don’t have to physically click on anything but read on to get the details. You can’t not praise it and like it! The Samsung Galaxy A5 is available at the Vodafone Fiji outlets for $999. Like mentioned before this phone is big on selfies! The device offers various features for its camera. You can argue has low quality. But its features top the quality. The Samsung Galaxy A5 has 13 mega pixels and 4123 x 3096 pixels. It also has autofocus and LED flash. The secondary camera or ‘Selfie Cam’ is at 5 mega pixels. Alright now for the juicy bits the features – it comes with a geo-tagging which is adding your location to images. The device also offers touch focus allowing you to purely focus on the target of your image. Face Detection is also offered in the device and this is great! The phone automatically detects your face and out focuses the surroundings. It also offers wide-angle selfies that is presented in 100 degrees for portrait and a 120-degree for landscape and panorama mode. Apart from the usual features the device allows you to take a selfie through palm detection. So basically you place the phone ready for a selfie. But instead of physically pressing the capture button you use your palm. All you have to do is place your palm in front of the camera view and you’ll have 3 seconds to get your palm out of the way before the shutter snaps to life– how cool is it? Ok so another feature that completely amazed me was the GIF mode – Like whateven? So on the right hand corner of the photo galley there is a menu icon once selected there will be a tab called create Graphic Interchange format (GIF) file. After that you need to select 20 images maximum and it’s done! It creates a video of all your images controlling the speed factor by your preferences. Then the best part you can upload it to all your social media apps or VoIP apps but only after converting the GIF into a Video through an app. Last feature to highlight is the Beauty Mode – this is found in every Samsung and LG front-facing camera. However, this goes a notch higher with the effects. Beauty Mode offers a feature to correct your skin tone and slim your face – WOW! No need to download a secondary app to filter your picture with the Samsung Galaxy A5. Samsung Galaxy A5 has a 5.10 inch screen which is the ideal screen size of most smartphones now. The larger screen is easy to work with more adaptable, whether it is for working purposes or for a simple browse through the web. The phone has 1080 x 1920 pixels, weighs in at 123 grams and has 16M colours. This explains the sleek and slim description of the phone. That said, the device is perfectly suitable for enjoying gaming or YouTube clips and with the expandable storage you can carry lots of media around with you. The phone is also great when it comes to multitasking. On the left end of centre button is store all your opened apps. So you can swap from various apps without having to return to your main screen. Not a great fan of this feature – the Nano-Sim! Yes the phone offers a nano-Sim slot of the right slot of the phone. It’s not bad but if you’re switching device regularly it can come as a hassle. The Samsung Galaxy A5 is running on Android 4.4.4 KitKat however, the upgradable version 5.0.2 Lollipop is available. The device is power packed with Quad-core 1.2 GHz cortex-A53. The Samsung Galaxy A5 has an internal storage of 16 GB which allows you to store a lot of media data. However, if you’re someone that has a lot of media to store then this device is great because it has a microSD slot up to 64 GB. The Random Access Memory (RAM) is at 2 GB. The battery life for talk back time is up to 15 hours and music play is at 68 hours.